On 6 Feb. the BIB drew attention to a new book, The Bluegrass Hall of Fame: inductee biographies 1991-2014, by Fred Bartenstein, Gary B. Reid, and others. The publishers - the International Bluegrass Music Museum (IBMM) in Owensboro, KY - announced the 250-page book as 'an absolute treasure for bluegrass fans'; and I'm delighted to confirm that that is exactly what it is. 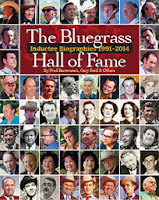 This is a reference book of bluegrass history, packed with well organised information and attractively designed. The text (a pleasure to read) is pithily written by people with a vast knowledge of what and who they're writing about. The photos, many previously unpublished, were mostly taken when the subjects were at the height of their careers - a notable exception is the 1953 shot of Doc Watson playing a gold-top Gibson Les Paul electric. Watson, like the original Carter Family (also covered here), was not 'in' bluegrass but had such a profound influence on it that he could not be passed over. Similarly, as well as musicians the Hall of Fame includes agents and promoters (Lance LeRoy, Louise Scruggs, Carlton Haney), record label owners (Syd Nathan, Dave Freeman), writers (Bill Vernon, Charles Wolfe, Neil Rosenberg), and more. Some names are more familiar than others - which is exactly why this book needed to be written. These are all people who have been recognised as of outstanding importance in the development of bluegrass since 1945. As their careers were closely interwoven with many others inside and outside the bluegrass world, the reader learns a great deal more about the music and the lives it affected than a mere list of the names here might suggest. The Hall of Fame gains new members every year. I hope the successor to this book appears before 2039 and measures up to it in quality; though this will be a hard act to follow. Several years ago British Bluegrass News, the quarterly journal of the British Bluegrass Music Association, was already a model of what a national association magazine should be. It is now measuring up to international standards in production and especially in content. Though its primary concern remains with the scene in Britain, the latest issue includes three interviews with US artists (Mike Marshall, Tim Stafford, and Mike Compton) that match anything I've seen in a US publication. Tom Travis's series on 'The development of bluegrass music in Britain' will be a primary source whenever someone gets round to writing up that piece of history. There are ads for instruments of mouth-watering quality. The BBMA has appointed an international representative, Dublin-born Eugene O'Brien of the fine Belgian band The Sons of Navarone. And there's a nice half-page guide to 'Jam etiquette'... Really, it's a very good bluegrass magazine; and knowing what's going on in the neighbouring island has to be a bonus. PS: The BIB reader who sent me a query recently about the continuance of the Didmarton Bluegrass Festival in England will be glad to learn that it is happening! This year's festival is on 4-6 September; acts are still being booked, and progress can be followed on the Festival's website and Facebook.